SINGAPORE: IJM Land Bhd, a leading property developer in Malaysia, is set to mount a roadshow to launch the "Canal City" project in the Klang Valley early next year. Chief executive officer and managing director Datu Soam Heng Choon said:"We are going to launch the "Canal City" in the Klang Valley middle of next year. "So, we are going on a road show for the launch (of the project) may be by the beginning of the year. "It was called the Canal City last time, but we are going out there (during the roadshow) to give it a rebranding," he told Bernama today. The project with a gross development value of more than RM10 billion will be sprawled over 800 hectares at the back of the Kota Kemuning and Kota Permai Golf Course in Shah Alam, Selangor. "The design will be based on the green city concept. It is one of the the first green township that we are developing and the project will be one of the first few big green townships in Malaysia" he added. Soam said the project, comprising a mixed township of commercial and residential components, would be fully completed within 12 and 15 years. Touching on the city concept, Soam said a water and canal feature would be incorporated to run through the entire development. On the probability of looking for investors, Soam said:"Not so much because we already have experience in carrying out township developments. "We actually have township and niche project developments like "The Light Waterfront Penang" project," he said. Spread over 60 hectares, the RM5.5 billion iconic waterfront development will comprise residential and commercial components complete with 100 per cent fibre optic infrastructure. Soam said IJM Land was currently undertaking projects in Penang, Klang Valley, Johor, Sabah and Kuching. Currently, IJM Land has a landbank exceeding 4,000 hectares with a gross development value of more than RM20 billion to be realised over 20 years. Despite talk of a recession, the Malaysia property scene is still buoyant with many people wanting to buy homes, especially in the city centre and in Johor. HomeGuru.com.my country manager Steven Tan said there is a lot of interest among overseas investors to buy homes in Malaysia via the Malaysia My Second Home programme, especially in places like Sabah, Kuala Lumpur and Johor. “As for Penang, the trend is different as many locals are snapping up properties there, mostly luxury condos,” Tan said in an interview with Business Times. He added that another emerging trend in the Penang property market was that in recent months, there has been a lot of interest among Singapore investors to snap up heritage buildings on the island. On HomeGuru’s recently concluded survey, in which some 2,800 people were interviewed on the local property market, Tan said 63 per cent of the respondents felt that properties across the board in Malaysia were expensive. The survey also revealed that 78 per cent of the respondents felt that bungalows were the most expensive type of property. Tan added that some 18 per cent of the respondents also indicated that they were planning to invest overseas in the coming months. HomeGuru is a Singapore company which has been in Malaysia for slightly under a year. Its 11-month-old website has about three million visitors a month, Tan said, adding the Malaysian HomeGuru website has over 10,000 agents with more than 70,000 properties to buy and sell. HomeGuru is the second most popular property portal in the country, but it holds pole position in three other countries, namely Indonesia, Thailand and Singapore. PETALING JAYA: The winds buffeting the property industry may become stronger with the introduction of guidelines by Bank Negara to rein in household debt which becomes effective from Jan 1. RHB Research Institute Sdn Bhd analyst Loong Kok Wen said in a report that these regulations would have an impact on the industry with the high-end segment of the market being more sensitive to regulatory tightening as financing availability gets narrower. She said the stricter lending rules were likely to result in a 14%-37% decrease in affordability with the impact to be felt from the first half of next year. The central bank issued guidelines last week in a move to clarify lending practices among financial service providers which included the requirement by banks to make appropriate assessment into prospective borrowers' income after statutory deductions and consider all outstanding debt obligations. Loong said that although banks were already assessing potential borrowers' net salary in their evaluation process, lending would likely be tighten on home mortgages going forward on worries of rising household debt to gross domestic product (GDP) levels. She said fundamentals in the market remained weak with the prolonged sovereign debt crisis in the European Union overshadowing the global economic outlook. “From our recent conversation with developers, potential buyers are indeed taking longer time in their property buying decisions than previously, especially on premium properties. Mass housing will continue to fare better due to pent-up demand,” Loong said. She added that property sales were likely to taper off (after a 21% growth in 2010) with a growth of 0% to 5% in 2012, given that sales were largely driven by GDP growth. Loong said the house was maintaining an “underweight” and was still cautious on property stocks although they have recovered in tandem with the temporary rebound in the equity market. “Our stock pick is selective,” she said, adding that UEM Land was recently upgraded to a “trading buy” and Mah Sing Group Bhd to “market perform”. Loong expects UEM Land Holdings Bhd to benefit from more oil and gas-related news flow in Iskandar, while IJM Land Bhd's share price could be supported by a potential merger and acquisition angle following the recent offer made by Permodalan Nasional Bhd to SP Setia Bhd. 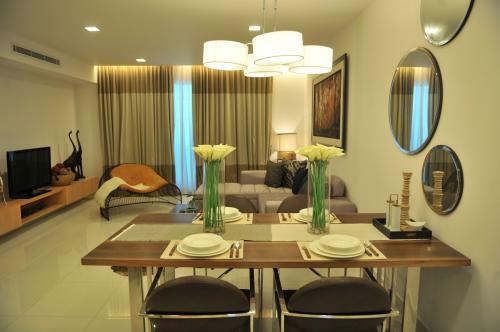 Each tower of Isola are corner units overlooking Subang Jaya and Glenmarie. Isola, the latest offering by Sime Darby Property in the renowned and award-winning township of Subang Jaya, saw 75 percent of its units snapped up within hours of public launch. Out of the 115 units available for sale, 85 units were sold at the close of the business day. Isola is a freehold development consisting of two 16-storey tower blocks that house 216 units of centrally located and quality apartments. The built-up area of each unit ranges from 95sq m (1,023sq ft) to 384sq m (4,133sq ft), with prices starting from RM679,888. The entire development has a gross development value of about RM220 million. 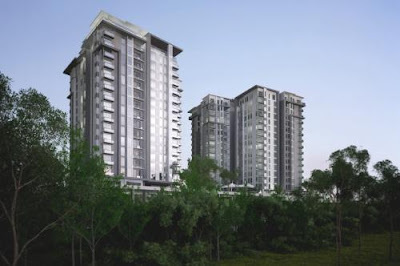 Sime Darby Berhad group chief operating officer Datuk Abdul Wahab Maskan who is also managing director of Sime Darby Property, said he was pleased to see the good response from home buyers and investors for Isola units. “The fantastic take-up rate on the first day of its public launch spoke well of the attractiveness of our products and promises to our customers. I salute our customers for their confidence in the market. We are together in making the current landscape of the property sector active and attractive. “As we track with cautious optimism of the sector’s outlook for the coming year, Sime Darby Property is confident that its products will continue to match market and consumers’ need in terms of right prices and sales requirements. “Prospects will continue to be strong, especially for properties built by reputable and sustainable developers in city centres, growth areas such as Klang Valley and other urban centers. The positive response to Isola today is clearly reflective of this,” he added. Isola, or “island” in Italian, is situated at a central location with direct access to major highways and other transportation hub, established business districts and private medical and public facilities. Units are designed with contemporary urban living features. It is close to the KTM Komuter, Sime Darby Medical Centre Subang Jaya, the Empire Shopping Gallery, Subang Parade, Carrefour as well as various colleges and educational institutions such as Taylor’s College, Metropolitan College, Monash University Sunway Campus as well as the Seri KL private school. Isola has been specially designed to ensure the privacy and safety of its residents. It features a residents-only resort-themed podium that provides a wide range of facilities and amenities to meet the needs of contemporary and discerning lifestyle. These include swimming pools, playgrounds, multi-purpose halls, gymnasiums and a mini forest. Isola has a selection of 12 different designs. All units are corner units that are also carefully planned to offer the best view of Subang Jaya while promoting natural ventilation. Feng shui philosophy is also incorporated into the development, ensuring that Isola is entirely chi positive.